A Viking sword estimated to date back to the ninth or 10th century has been found in the ancient city of Patara in Turkey's southern Antalya province. The sword was discovered during excavation work being carried in Patara, which was at one point the capital of the ancient Lycia region. 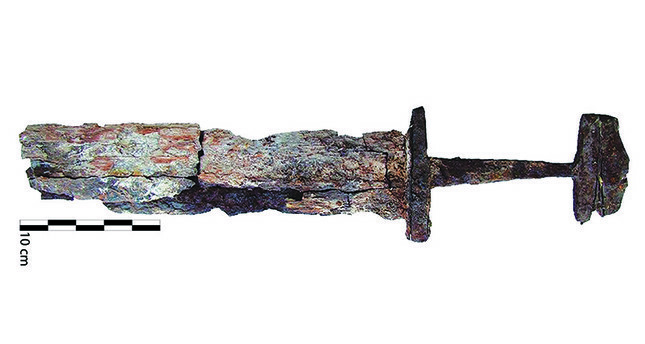 "Until today, one Viking sword that was discovered during the excavation works carried around Yumuktepe (district) of Muğla (province) was the only material culture remnant that indicated the existence of Vikings in Anatolia," he said. "The characteristics of the knob, tang and crossguard can be evaluated within the group of swords that was described by Jan Petersen as 'K type' or 'O Type'," he added about the newly-discovered blade. Excavations have been carried out around the area where the sword was discovered for 30 years, under the direction of Akdeniz University professor Havva Işkan Işık. Remarking the sword is estimated to belong to a Viking soldier during the sea warfare of the East Roman Empire, the professor mentioned that the preserved total length of it is 43.2 centimeters. Research suggests Vikings put swords in graves as a gift to the deceased person, but it is hard to decipher how this particular sword came to Patara. Vikings, known as Varangians, served as mercenaries in the Byzantine army beginning at least from the early 10th century. They came to constitute the Varangian Guard, which served as elite bodyguards for Byzantine emperors. Patara was one of Lycia's major naval and trading ports, located at the mouth of the Xanthos River. Patara's oracle at the renowned temple of Apollo (not discovered yet) was said to rival that of Delphi and the temple equaled the reputation of the famous temple on the island of Delos. It was believed that Apollo lived on Delos during summer but spent his the winters in Patara. The city surrendered to Alexander the Great in 333 B.C. During the Hellenistic Period, the Lycian Council Building was built. It is regarded as a symbol of democracy in Lycia and a sign of its ancient glory. The Roman general Brutus captured Patara in 42 B.C. The Lycian settlement was then annexed by Emperor Claudius and turned into a magnificent Roman site with mesmerizing beaches along the Mediterranean Sea. The city later came under Byzantine and Ottoman control. Modern visitors still flock to Patara's wide, tranquil beaches.